Last month I crossed into uncharted waters and confessed to my doctor that I was feeling a little fatigued still and bloated a lot. Well, it turns out that cutting out carbonated water and eating on a more regular schedule made a huge difference with that. But she suggested that I try going gluten free for a month. She had done it and seen that it was effective in some cases. Perhaps it would help my stomach and my fatigue. I wasn't crazy about it. At all. In fact, I have gotten pretty fed up with the whole gluten free craze. My self-righteous self wants to tell everyone that jumping on the bandwagon without a medical reason is absurd. Of course these people lose weight and have more energy: for once, their not overloading on carbs and chewing on whatever they see. Yet, I figured I could give it a try. Three weeks? That sounded a little much to me. So after some researching, I decided I would do a three week experiment parse. I would brave Colorado without gluten and cut out the gluten right away. I figured that if it would help, I wanted to do it right away. If it would be a waste of time, I wanted to get it out of the way. With my parents help, I stalked up on some tortillas and perused the Internet with common questions: Is there gluten in greek yogurt? Does cheese have gluten? Does beef jerky have gluten (it's a hiker's perfect food!) Turns out, I didn't eat that much gluten in the first place. I didn't really grow up on the heavy comfort food, so the only time I consistently consumed gluten was with a sandwich at lunchtime and with cereal twice a day. I did munch on grains throughout the day though and I knew that some of the cheeses and stuff I had occasionally would have to be cut out. The big thing though, was the cereal. What would I do without my staple food?! These are so super easy! All I used was 3 egg whites and half a banana. One pancake is only 110 calories and contains a lot of protein. Some variations include adding berries, cinnamon, chocolate chips, and/or other fruits. Be careful with these because they have to cook really slow and can get a little messy if you don't do it right. I've heard they are more solid with full eggs, but the egg white version works great for me. Also, they taste delicious! They taste just like a yummy banana pancake, which I think is not fair considering they take only 15 minutes to make and can be made by just about anyone (RELATED: Pancakes for the Kitchen-Inept). My mom has always been a freak for omelets. Me? Not so much. I love a good hard boiled egg, but I've never been crazy about eggs for breakfast. Until this little experiment, that is. I've found that I can't really eat before a run, so one day I after a morning run, I found myself a lot more willing to try an omelet for breakfast. I LOVE veggies, so I sauteed some spinach, mushrooms and squash first and then poured in 3 egg whites. This breakfast was even faster cooking than the pancakes. Once I'd cut up some grape tomatoes to add, it was about done. Ten minutes after I'd dared to try an omelet, I was sprinkling on some feta cheese and relaxing for a well made breakfast. I've also made my omelets with sun dried tomatoes, cucumber, arugula and-- this morning-- even fruit (which was good: I promise. Try it if your feeling a bit more adventurous.) 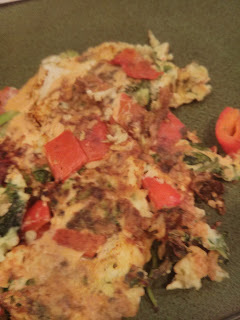 I am loving the fact that I can just grab veggies out of the fridge and throw them in my omelet. Five minutes later, I can be sipping some tea and eating the finished product. Whether or not you're gluten free, this is an easy recipe that's a must. There's no set ingredients or ideas. If you think it would taste good: try it! I've grown quite fond of my breakfast experiments, and although my parents are probably sick of half eaten bananas and melted spatulas, I like getting out of my comfort zone and redefining "cooking" for those who hate to really cook-- like myself. While I now have a box of Gluten Free Chex Mix at my mom's and dad's, I'm not dying for cereal anymore. I'm determined to keep my cereal addiction broken by coming up with crazy new ideas for breakfast. Although I found out that yogurt in pancakes doesn't work and that the mythical protein and water (only) pancakes are a waste of time, I've found that my endeavour has been a huge help in this gluten free diet and in getting my eating schedule back on track. At the end of it, I think I'll probably stay on a low-gluten diet and I will most definitely keep making messes in the kitchen to try and discover how I can escape the confines of cooking within the confines of the 40 minutes I have before work.